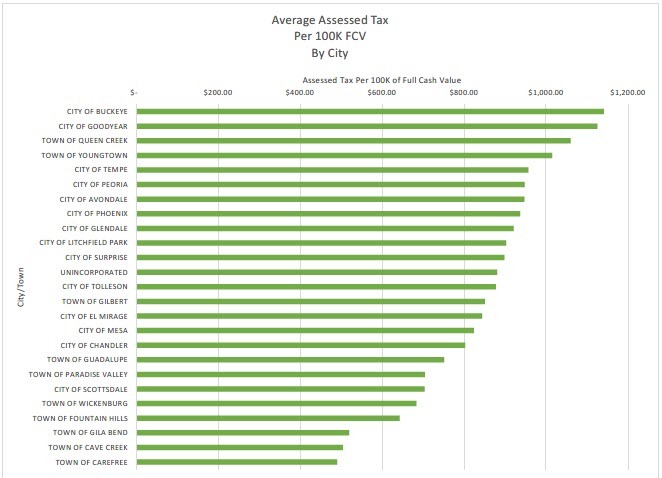 Below is a chart from a report by the Maricopa County Treasurer that illustrates the average “Assessed Tax” per $100,000 of Full-Cash-Value (FCV) for the various cities in the metro-Phoenix area. Generally, the higher assessed tax exists in communities where the individual property values are lower, and vice-versa. What is the practical effect of this? Given the same set of shopping criteria, which will define essentially the same house/property, if you can find that property in each of these communities, the property tax will be will about the same everywhere. Sure, the price will be different, but not the property tax. Of course, there is not going to be a house/property in everyone of these communities for any given set of same shopping criteria. But it is an interesting idea.